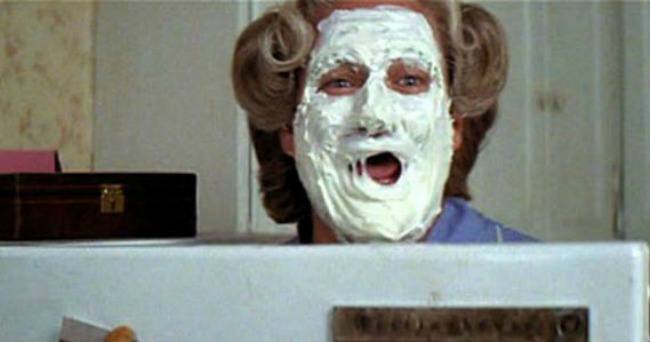 We all remember the 1994 classic family comedy Mrs. Doubtfire, yes? A heartwarming tale of a dedicated if absentminded dad who would do anything to spend time with his kids. Belly laughs, tears, the mom is mean, etc. Let’s take a minute to recollect the actual plot of Mrs. Doubtfire. Daniel Hillard (played by Robin Williams, who was a national treasure and who I mean no disrespect to the memory of) and his wife Miranda have three kids: the son, the older daughter, and the young daughter who says cute things and who later wrote a book about being a child actress. Miranda comes home one day to find that Daniel, without her knowledge, has thrown the party to end all parties for his son’s birthday. Seriously, it’s a nightmare. The cops are there, there’s a lamb and a donkey wandering around the house, kids are quite literally swinging from chandeliers. It looks like, conservatively, this “child’s birthday party” caused tens of thousands of dollars in property damage. And some kids probably got hurt, so there will be lawsuits. It’s a disaster and not something any responsible parent would allow. So Miranda, who it is implied has had to deal with this kind of behavior for years, files for divorce from Daniel. And, presumably based on the party situation and similar tales Miranda’s lawyer probably tells the judge, Miranda gets temporary residential custody and Daniel can only see the kids on Saturdays. So Daniel creates an alternate personality, as one does, an elderly English woman named Mrs. Doubtfire, who is then hired as a nanny for the kids so that Daniel, as Mrs. Doubtfire, can spend time with them. All without Miranda suspecting a thing. Is it any wonder some clever YouTuber was able to cut a trailer for “Mrs. Doubtfire as a horror movie”? By the movie’s end, Daniel has seen his custody rights stripped almost entirely by the court after his Mrs. Doubtfire ruse is exposed, but Miranda feels bad and realizes how much she loved Mrs. Doubtfire so she expands Daniel’s parenting time. And he doesn’t even have to put on the fake skin and hair now. Okay, a few things. First, Mrs. Doubtfire takes place in San Francisco and I’m a New York lawyer, so maybe things work differently out there (maybe this sort of drag-nanny-parenting is more common). But here, the kids would be given their own attorney who would represent strictly their best interests. That could throw a wrench in the movie’s happy ending, where Daniel gets to spend lots of unsupervised time with his children. Lots of attorneys for the child would oppose an arrangement like this until a psychiatrist cleared Daniel. Because here’s the thing: what Daniel did was crazy. Judges will deny a parent custody for reasons far less serious than creating an alternate persona and creeping back into the marital residence. The most realistic outcome of Daniel’s stunt, from a family law perspective, would be years of supervised visitation and psychiatry until it was clear to everyone involved that Daniel would not be a threat to his children. And Miranda would have an easy case for a permanent restraining order. Frankly, if I were the judge, I would question Miranda’s judgment, too: she realized she “loved” Mrs. Doubtfire (who is fake) and this was sufficient for her to not only forgive Daniel, but essentially give him unlimited unsupervised time with her kids? Remember the scene where Daniel throws an orange at the one guy’s head? There is a lot going on here. And not for nothing, but Daniel is probably going to have some other problems. For example, did Miranda ask Mrs. D to fill out tax paperwork? Did Daniel put his name as “Euphegenia Doubtfire” and make up a social security number? Because that would be a crime. Also, I think there’s a good chance he could be prosecuted for stalking, endangering the welfare of a child, and probably a few other things depending on how cooperative Miranda was with the prosecutor’s office. Anyway, sorry to ruin Mrs. Doubtfire for you all. It’s still a really funny movie! So, there’s that.